This time of year is an always exciting time of year. Why? It’s Sale-A-Bration time! As you all know Sale-A-Bration products have been available to us for a few weeks now. Well now there is more exciting news! Sale-A-Bration Second Release Items and Sale-A-Bration Coordination Products are coming your way! The Stampin’ Up! 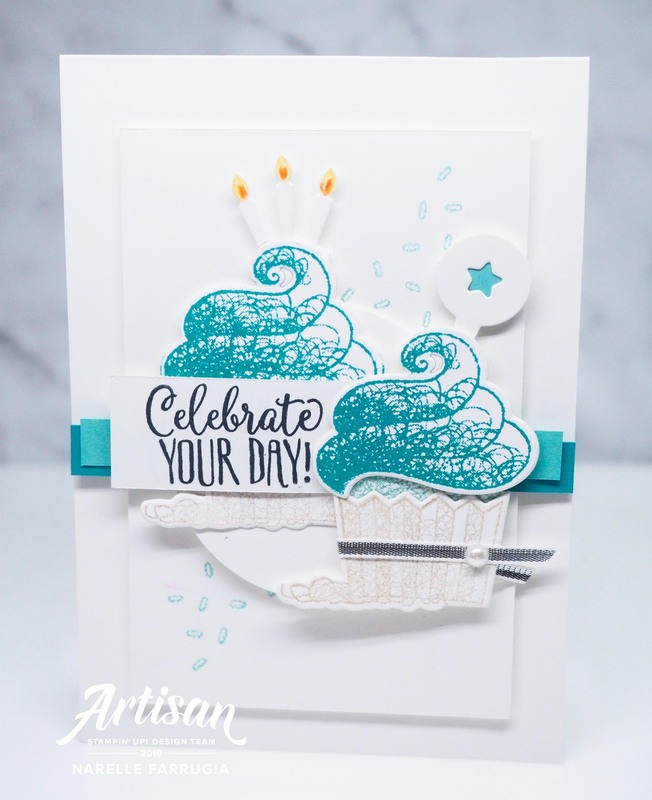 Artisan Team are featuring products from both the Sale-A-Bration Coordination Promotion and Sale-A-Bration Second Release items with a blog hop. The coordination promotion features brand new products that coordinate perfectly with select Sale-A-Bration items. These products are only available for a limited time. As a demonstrator we can pre-order these goodies from 1st February – 28th February. So think about purchasing them early to start planning for your classes or workshops. You can let your customers know that these products are available for them to order from 1st March – 31st March. From the Sale-A-Bration Coordination Promotion I’m featuring Call Me Cupcakes Thinlits Dies on my cards. These dies coordinate with the Hello Cupcake Stamp Set. 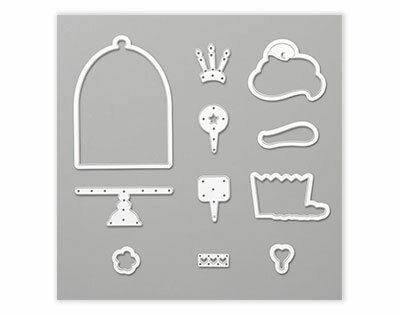 Matching stamp set and dies are the perfect products to showcase at a workshop or class. Any level of crafter will find the images easy to stamp. Once the images are run through the Bigshot, they can layer them together to create cupcake goodness! 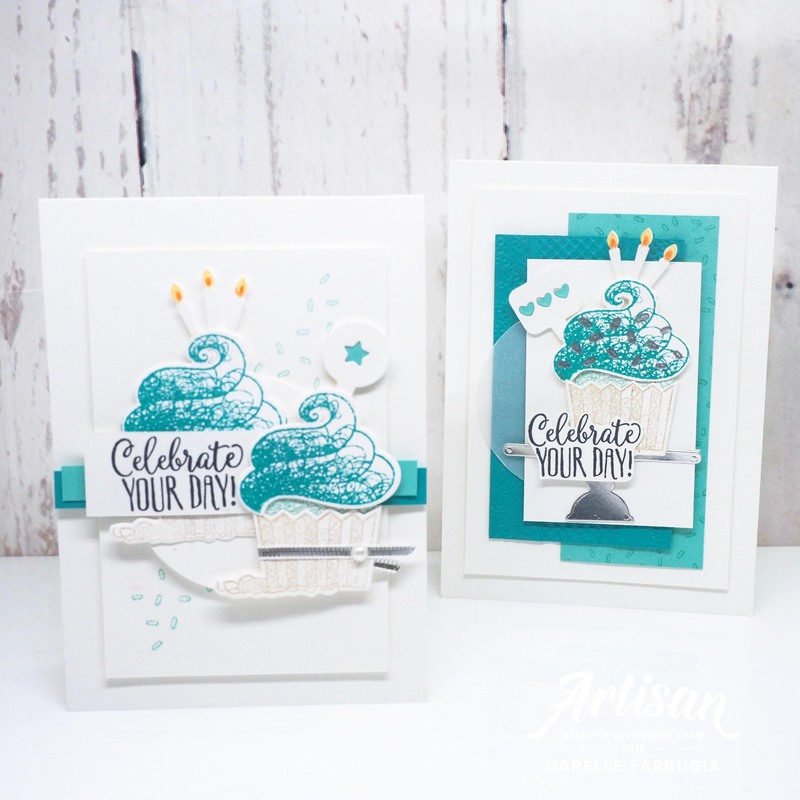 I chose the colour combination of Bermuda Bay, Pool Party and Whisper White for my cards. The base of the cupcake is stamped with Crumb Cake Ink. The icing image is stamped with Bermuda Bay Ink and the bottom layer of icing is stamped in Pool Party Ink. My first card has lots of layers. I stamped the confetti stamp randomly on Pool Party Cardstock and placed it on the base of my card. I then embossed a piece of Bermuda Bay Cardstock with my Lace Dynamic Textured Embossing Folder and placed a circle of Vellum Cardstock over it. I then diecut those cute little candles and used my Watercolor Pencils to give them life. How cute is the little cupcake topper? 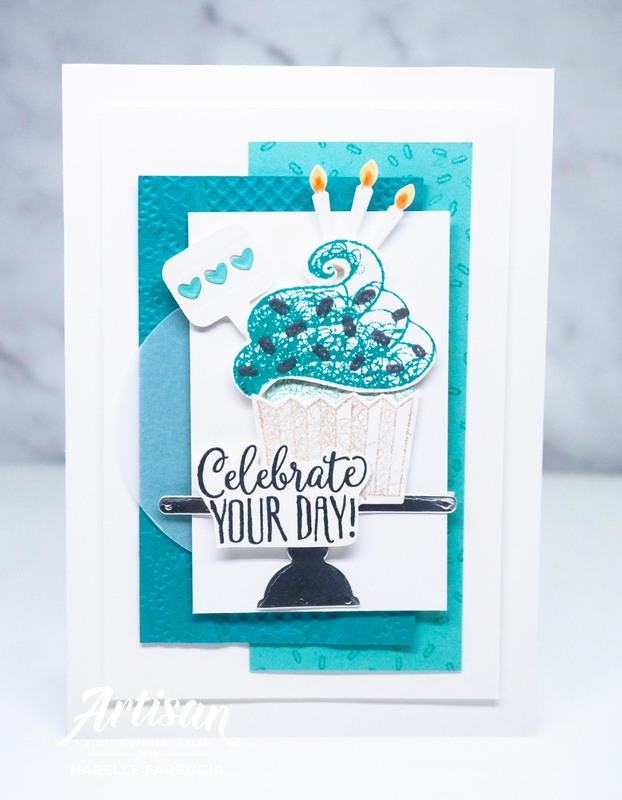 This little topper was created with one of the dies from Call Me Cupcake Thinlits Dies. The cake stand is make from a piece of Silver Foil Sheet. The sentiment I’ve used is also from the Hello Cupcake Stamp Set. I fussy cut the sentiment out and placed it over the base of the cake stand as it looked a little bare when I had it placed higher. What’s better than one cupcake? Two cupcakes of course! I used the confetti stamp this time randomly on the card base this time. I layered the cupcakes over Bermuda Bay and Pool Party Cardstocks and added the same sentiment from Hello Cupcake Stamp Set. I used the circle cupcake topper from the die set on this card and also the same candle die as my previous card. The next blog to hop to is my fellow Artisan Design Team Member from Melbourne, Rochelle Blok. Rochelle is all about elegant layering and all things pretty. If you get lost along the way, I’ve listed all of our fabulous Artisan’s links to their blogs below. All you need to do is click on their name to visit their blogs and their fabulous creations.